The B Local program is a long term, extremely effective investment for any type of business. It is a win win for both the business and the member. 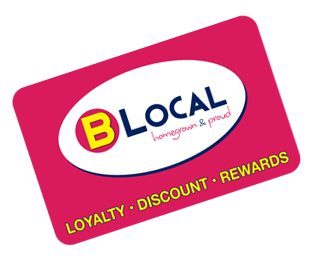 A member who refers a business that joins the programme will receive a €25 gift voucher from that business courtesy of B Local. Members can refer as many businesses as they wish – there is no limit. As soon as the referred business officially becomes a B Local partner the referring member will receive the gift voucher immediately by email or post . 1.By email through the refer and earn link on the member’s dashboard of blocalcard.com. 2.Through your Facebook,Twitter or Linkedin pages, or through other social media. 3.Through direct contact with the business, in person or by telephone. The refer and earn link is located in each member’s page after login. If using direct contact please ensure the applying business quotes your B Local card number in ‘The Referer’ field on the sign up page.